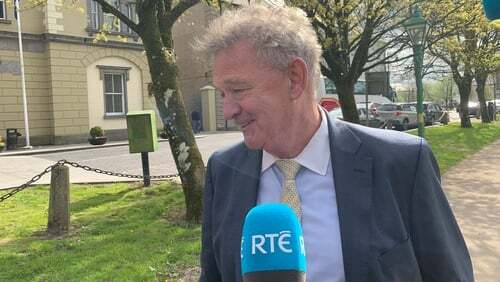 Businessman Peter Casey is to contest next month's European Parliament elections in the Midlands-Northwest constituency. Mr Casey submitted his nomination papers to returning officer Fintan Murphy in Castlebar this afternoon. The announcement by long serving MEP Marian Harkin that she would not seek re-election is thought to have been a significant influence on his decision to stand. Her departure leaves a sizeable vote, built up over 15 years, to the rest of the field. In 2014, she took almost 69,000 first preferences across the sprawling electoral area, which runs from Malin Head to south Galway, and as far east as Laytown in Co Meath. Mr Casey came second in last year's Presidential election, securing 23% of the vote. His campaign was dominated by comments he made about the Travelling community, which led to criticism in some quarters. In the aftermath of that election, he indicated he would stand for election to the Dáil in the Donegal constituency. His campaign team says that he has put those plans "on ice" to concentrate instead on next month's European election. Mr Casey says he will focus on the impact of Brexit, particularly in border areas. Among his priorities are the creation of a specific "innovation zone" to support business expansion. Mr Casey claims he has a good understanding of the business environment which he could use in a European context. He has also called for a discussion on immigration and the need to ensure there is an adequate spread of migrants across the country. In addition, he wants enhanced efforts to encourage students to study in rural Ireland, through the provision of free or discounted education. Mr Casey says Ireland should lead the way in eliminating single use plastics and has called on drinks companies to return to the use of glass or embrace biodegradable bottles. He says he hopes he can attract support from across the political spectrum. On the topic of rural broadband, he says the Government "doesn't have a clue" about the best way to provide universal internet access. He contends that it is impractical to bring fibre connectivity to every home in Ireland. Instead, he's advocating the use of 5G technology to meet the demand for high speed internet access. The four seat Midlands-Northwest constituency takes in all of Connacht as well as Donegal, Cavan and Monaghan and several counties in Leinster. In 2014, independent candidates Luke Flanagan and Marian Harkin were returned, along with Fine Gael's Mairead McGuinness and Sinn Féin's Matt Carthy. Seven other candidates have already been nominated for the Midlands-Northwest constituency. They are Dilip Mahapatra, Luke 'Ming' Flanagan, Saoirse McHugh for the Green Party, Maria Walsh for Fine Gael and Cyril Brennan as well as Anne Rabbitte and Brendan Smith for Fianna Fáil.